2006 was kind of a rock bottom year for me. Or the year that everything started to turn around, depending on how you look at it. I was in college, feeling helpless against my eating disorder, and lost in a pretty deep, dark depression. She was half Russian. Me? Only an eighth. But I guess a little goes a long way. That was eight years ago, and she’s been gone for two summers. But I remember the things she said because I copied them into my diary right away. I knew then that they were important, that they held some very simple but very profound answers for me. See, Grandma was what some people would call a sensitive person. I guess I am too. Now, I’m not saying that I’m a textbook Highly Sensitive Person (HSP). I just mean that I really internalize whatever’s being dished out around me, you know? When someone else in my general vicinity is not right, I definitely do not feel right. Just a whiff of conflict and my body goes into full fight or flight. I get anxious — a lot. A gruff interaction with a stranger on the subway will stay with me for hours. If one of my mistakes adversely affects another, I can assure you that I’ll have sleepless nights over it for years. And yes, I can go from laughing to crying at the drop of a hat. All too often, my first instinct is to assume that any unpleasantness is my fault. I’ve done something wrong. They’re mad at me. I need to fix this. Which of course is rarely the case! First of all, not everything is about me (thank the universe). And second, everything can’t be perfect all the time (thank the universe). Still, it’s overwhelming to feel this much, and it can’t just be turned off, however hard I try. I’ve known a person or two whose dispositions trend towards sociopathy, and I’d be lying if I said I’d never once wished that I were more like them. I mean, it must feel pretty freeing, in a way, to have no concept of other people’s feelings whatsoever. But who would really want that? 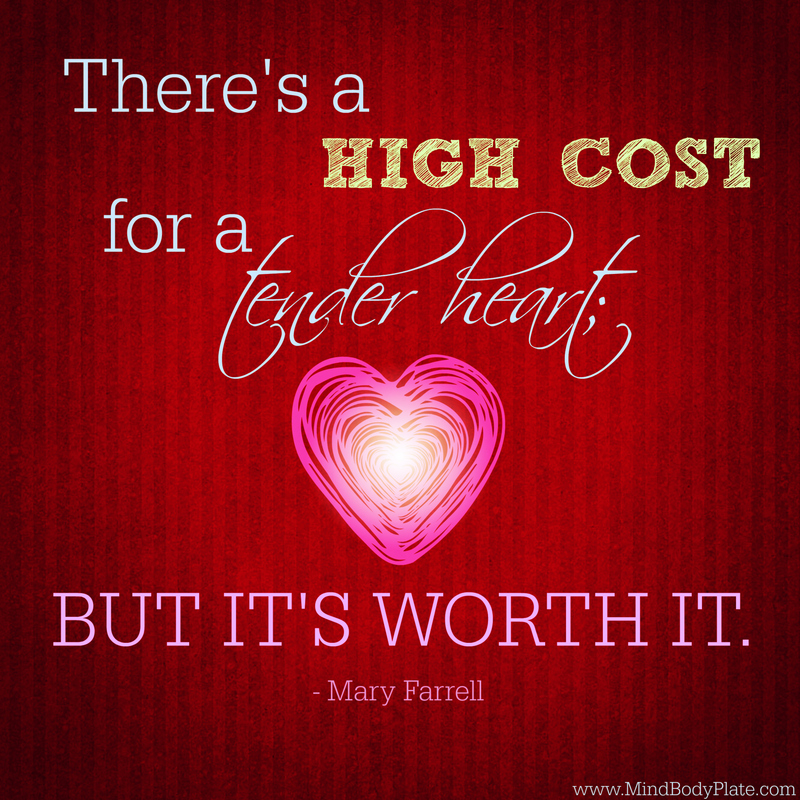 There’s a high cost for a tender heart; but it’s worth it. And you guys, she’s totally right. I may struggle sometimes with the kind of pain that tends to seep through thin skin, but I’ll be damned if I’m not squeezing every inch of feeling out of this one life I have to live. And let’s not forget that the sensitivity causing me trouble is the very same sensitivity that makes me an empathetic listener; a helpful coach; an intuitive yoga teacher; a kind leader, and a caring and thoughtful friend to those I love. Every piece of art I’ve ever created, on stage or on paper, has been informed by my ability to feel things deeply — to feel sad like I never thought I could feel sad; to feel joy like I never thought was possible. And for that I am grateful. Even for the pain. What about you guys: Do you sometimes wish that you had a thicker skin? Has anyone ever told you that you were being “too sensitive”? What are the overlooked benefits of being you, exactly as you are, tender heart and all?